Willy Wonka News– Week 10 PERFORMANCE WEEK! It’s Performance Week!!!! This email will cover final dress rehearsals, show and call times, volunteer/bake sale needs, show promotion, and the cast party. PLESAE READ TO THE END. The remaining rehearsals are dress rehearsals. Please send your cast & crew in their base blacks. Please be there on time and ready– no absences. Each and every child plays an important role and their cast-mates are depending on them! *We are highly encouraging the opposite cast/crew to come (or stay) and watch the other’s run through that night. It is a great opportunity for the kids to run the show in front of an audience before they have to do it for real. This is not mandatory, but encouraged. We do ask that if you allow your kiddo to watch their fellow thespians, that they are there for the whole run through. In other words, Loompas would need to be there by 6:00 to watch, and Oompas would need to stay until 8:45. A lot of movement in and out will be disruptive to the rehearsing cast/crew. Please send your children in their base blacks on their performance days/times. Call (which means the time cast and crew are supposed to be at the school, ready to roll) is 45 minutes before the performance start time. Please see below for exact times and mark your calendars. Y’all have truly been awesome. Liza and Traci have been thrilled to have your support in pulling this off! You’ve done so much, and we need just a little more. We are almost to the finish line! We still have empty slots that are crucial to fill for Performance Week. Please click on this Performance Week Sign Up Genius and sign up. I’m a broken record, but we still can’t do this without you! ALSO there are still plenty of slots available on the the Bake Sale Sign Up Genius. Please sign up so that theater goers can delight in scrumptious sweets while they enjoy Willy Wonka. It’s a candy-heavy theme this year so you might not even have to turn on the oven. Funds generated from the bake sale cover some play costs. Please take a look and sign up to donate! We are planning to promote ticket sales this week and are still coordinating with the administration about the details. The plan is for cast and crew to wear their tie-dye Wonka shirts and green beanies to school on Wednesday to create buzz and get kids excited about the play. There will be postcards distributed to each teacher for kid mail and Wonka cast and crew will have some to hand out as well. We also hope to have announcements over the intercom about it, delivered by a couple of cast members. Your kids should bring their Wonka shirt and beanie home from rehearsal on Monday to have them for Wednesday. If you think that your child will lose their green beanie or Wonka shirt, then they should not participate in promotion day. The most important thing is that everyone shows up to Wednesday’s rehearsal will all their costume pieces. Talk about this with your kiddos. Stay tuned for more info. The cast party for all Wonka cast & crew will happen directly after the final performance on Saturday evening, which will be around 8:00/8:15. There will be pizza, snacks, sweets, music, and general fun. Parents, please consider staying and partying with us (maybe after you’ve helped take down the set– the more the merrier)! We could use your help making sure the party is fun for all. We will wrap it up at 9:30 at which point all of our children may be adorable monsters jacked up on cake and adrenaline. Good times, indeed. These emails are archived on the school play website here along with a lot of other useful play info. Loompa Rehearsal NEEDS VOLUNTEERS tomorrow night! Because we are splitting cast rehearsal times for tomorrow’s rehearsal we are also splitting volunteer chaperone shifts, so you don’t have to chaperone while your child doesn’t need to be there. Currently we have zero volunteers for the Loompa’s rehearsal from 6:00-7:15. Please hop to the Sign Up Genius as soon as possible to sign up for a shift! We can’t have this rehearsal unless we fill those slots. We want your kids to feel confident and prepared, and they can’t do it without you! PLEASE READ– we still need performance week volunteers! We seriously can’t make it work without you and we are in the home stretch! And when I say Performance Week I mean NEXT WEEK! I’m not yelling, just excited. We will be even more excited to see that performance week Sign Up Genius fill up. Thank you!!! If your child received a Large T-shirt tonight and is just swimming in it, I believe they got an Adult Large instead of a Youth Large. Please look at the tag. The Youth Larges say Youth Large and the Adults just say Large. If you child received an Adult Large, please have them bring it back and I will exchange them. I have identified 2, possibly 3 of them so there should be another one out there. Thanks for checking and I apologize for the confusion. Bryant Blast – Save the Date! 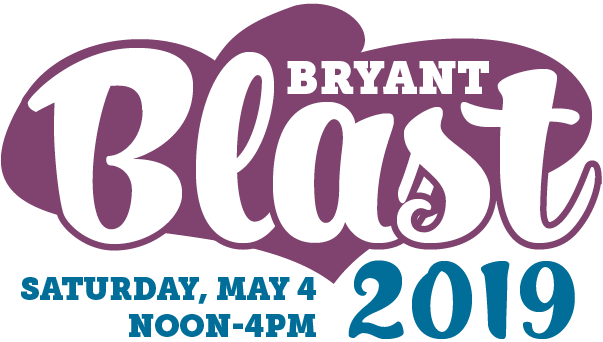 The Bryant Blast will be held on Saturday, May 4th from noon to 4 pm. Plan for pony rides, fun games and activities, sno-cones, tasty food and much, much more! Wanna help plan the Blast? We’ll be sending a sign-up for volunteer shifts right after Spring Break. If you have a favorite job at the Blast, you can sign up early! Contact the Blast Committee if you’re interested in helping. 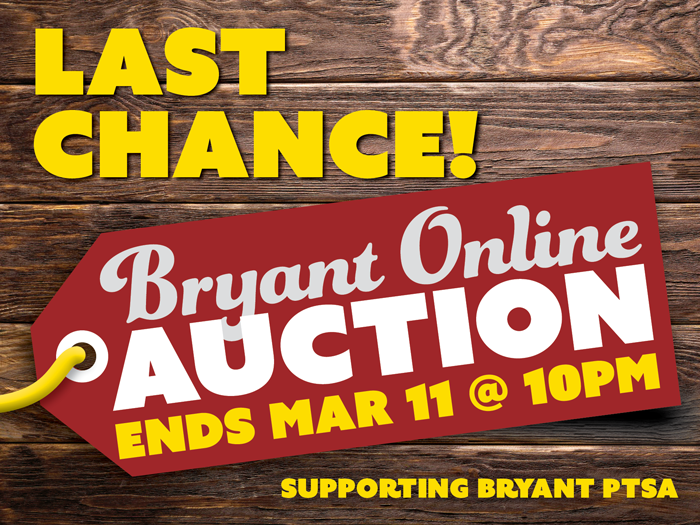 The Bryant online auction will close TONIGHT at 10 p.m. Just a few more hours to participate, if you haven’t already, and check your bids. Don’t lose out on your favorite items! Please support the PTSA, and have some fun while you’re at it! There are less than 2 weeks til performances! Woo! PLEASE READ TO THE END. This edition is packed with new info. And remember, these emails are archived on the school play website here along with a lot of other useful play info. Bookmark it for easy access! Regular rehearsals this week on Monday and Thursday, as well as Dress Rehearsal for the both casts on Saturday. See below for more details. This Thursday, March 14 your kids need to bring their costume boxes with all their costume pieces inside to rehearsal. Please make sure the outside of their box (with lid!) is clearly labeled with their name, their character(s) name(s), and their cast name. If your child has a costume/costume piece that has not been seen/approved by their director, please take a photo of them in the costume piece and email to bryantschoolplay@gmail.com I know that some kids have been bringing their pieces that still need approval to rehearsals, but things get so busy the directors often don’t have a chance to take a look. We will forward the photo to their directors for feedback. For Dress Rehearsal this Saturday, please send your cast and crew members in their base layer blacks (black pants/leggings and black t-shirt). First, I want to send a HUGE THANK YOU to all of you who have made this exciting adventure possible so far. Y’all are truly awesome! Aaaaaand, we have more to ask. We have brand new sign ups for Performance Week! Please click on this Performance Week Sign Up Genius to sign up for volunteer opportunities. We still can’t do this without you! ALSO— check out the Bake Sale Sign Up Genius so that theater goers can delight in scrumptious sweets while they enjoy Willy Wonka. Bubbles! Calling all bubble blowing devices! If you have bubble wands or (silent) bubble guns to share for the performances, please send them with your kids to the next rehearsal. We have bubble liquid, but need bubble wands/blowers and bottles to hold the liquid. Stay tuned for next week’s installment of Willy Wonka News.